According to the calendar it's Winter. However as I look out the window it looks like Spring..all the snow has melted and it is mild and pouring rain, but tomorrow they are forecasting snow again? Whatever it is doing outside this is still the time of year I turn to the oven to create warm dishes to soothe away the damp chill. 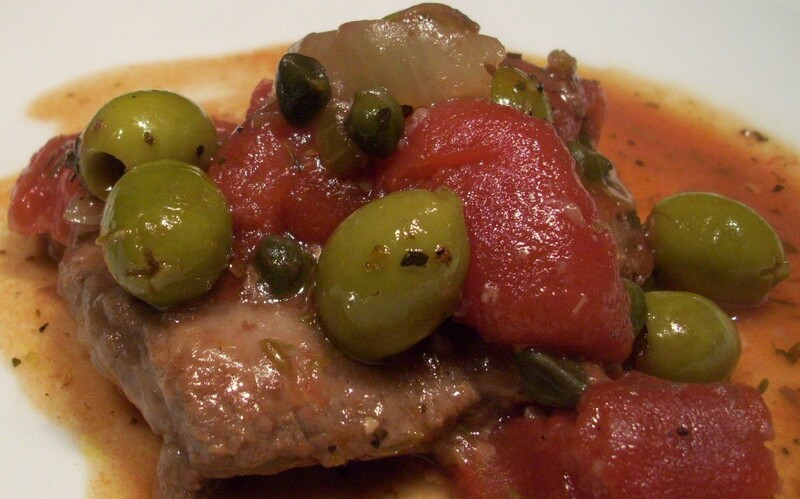 This is a twist on the traditional dish Swiss Steak. I've given it a Spanish flair by adding olives, capers and lots of herbs. Capers are found in the condiment section of the grocery store near the pickles. They are the bud of a plant found in the Mediterranean and they are salty like olives. Whatever kind of Winter we are having, enjoy the comfort food that comes along with it! Generously sprinkle flour on a shallow plate and dredge to coat all sides of the steak. Heat oil in a deep oven proof dutch oven or deep pan with a lid. Brown the steak on both sides in the oil over medium heat on stove top. Add remaining ingredients over top and toss a bit to mix together. Cook for 1 to 2 hours depending on the cut of steak and desired tenderness. Remove cover for last 15 minutes to allow sauce to thicken a bit. Serve alongside mashed potatoes or rice.